Buick is known for building cars as quiet as a mausoleum on a moonless night, but when a turbocharger was added to the elegant Verano model, the brand suspected it might attract a more discerning buyer interested in the sound an engine should make as it speeds away. Besides, any large touring sedan than can go from zero to 60 in 6.2 seconds needs a distinguish exhaust note to mark its lofty departure. It would seem a car engineered to produce such a serene passenger cabin would be a difficult venue in which to instill the prurient growl of a high-revving turbocharged V6 engine, but it turns out that fact created a virtual concert hall for the sound engineers to work within. Basing their work on the Regal GS luxury sport sedan, the engineering team on the Verano was charged with testing numerous exhaust systems, rejecting the ones too raucous or vibratory, as well as the ones too whisper quiet, to find the one tonality perfectly reflecting the Buick Verano Turbo’s refined character. 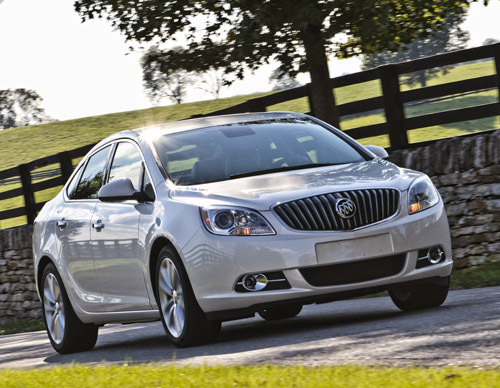 Buick uses a process known as QuietTuning on all Verano models to block or absorb sound while dampening or eliminating vibration. It is part and parcel of every aspect facet of the vehicle architecture, making it the quietest compact sedan on the road, even outdoing many mid and full-size cars in this area. This quiet comfort zone is created by the use of acoustic laminated glass, triple door seals and the highly refined dynamics of the chassis. Even the 18-inchwheels are specially manufactured to minimize road noise. Though they have their faults, one of the most aesthetically pleasing aspects of the internal combustion engine is the way they sound when perfectly tuned and channeled. We’re willing to bet Buick got it very right on the new turbocharged Verano.